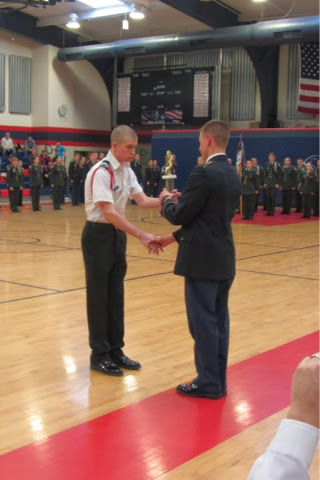 My son Ryan Estep is a sophomore at the Carson Long Military Academy in New Bloomfield Pennsylvania. He is a leader at the school and his drill team today won a major competition placing first in all categories and will be heading to a national competition in New York next month. I am very proud of my son and his teammates. Here is a photo of him accepting the first place award. For more information about the oldest American military boarding school visit carsonlong.org. 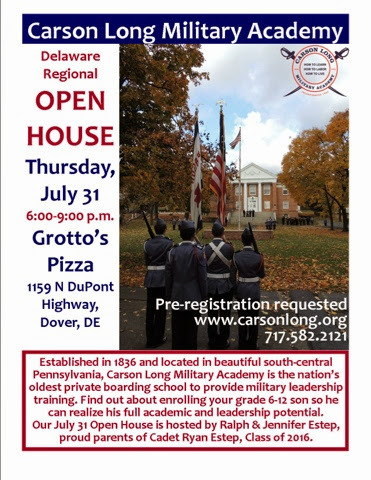 We are also planning an open house in the Delaware area this summer if you are interested in enrolling your son in a school which will change his life and develop leadership. TaxBot - This is a must have APP that may save you thousands. I know your time and money are very valuable so I want to make this short . I have found a tax tracking system that I know will save you both time and money when it comes to keeping track of your receipts and mileage logs. You need accurate records more than ever! As a business owner or independent contractor you are 4 to 6 times more likely to be subject to a IRS audit. The IRS has announced they want to hire over 10000 more agents once funding becomes available. More than every you need to make sure you have back up records for the deductions you are claiming. This inexpensive, simple and easy solution is currently being used by tens of thousands of business people across North America. Please watch short video because I believe it will help me help you save big MONEY on your taxes. Please take a look at the link below. I have secured a 50% discount for my clients on the service if you use the link below. The IRS announced on its website that, beginning in 2014, it will stop providing a number of taxpayer assistance services in person or over the phone and will shift those services online. The move is designed to free up IRS employees to help taxpayers deal with issues, such as identity theft, that cannot be resolved through other avenues. The changes are being made in the following areas: (1) tax return preparation, (2) transcript delivery, (3) tax law assistance, (4) refund inquiries, (5) employer identification numbers (EINs), and (6) the Practitioner Priority Service. Return preparation: In recent years, the IRS has provided limited tax return preparation services at its walk-in offices. There have been restrictions on where and when the help is offered and the IRS has required taxpayers to have income below the earned income tax credit thresholds to get help. This help will be further reduced beginning next year, as taxpayers are directed to the more than 13,000 volunteer tax preparation sites instead of the 250 IRS walk-in offices. The IRS also noted that Free File is available to taxpayers on the IRS’s website. Transcript delivery: Early in 2014, the IRS will debut its Get Transcript service, which will allow individual taxpayers to use their Social Security numbers to view and print a copy of their tax transcript. Get Transcript will be available for the following types of transcripts: tax account, tax return, record of account, wage and income, and verification of nonfiling. Taxpayers will still be able to request that a transcript be mailed to their address of record using the online tool or sending in Form 4506T, Request for Transcript of Tax Return. Tax law assistance: Most tax law questions the IRS receives during filing season are basic questions such as who qualifies as a dependent and who can take an exemption. The IRS will continue to answer these types of questions, but it will refer more complex questions to resources on the IRS website. Refund inquiries: The IRS says the most common questions taxpayers ask are related to the status of a refund. The IRS notes that for the first 21 days after a return has been filed electronically or for six weeks after paper filing, taxpayers should check the status of their refund on the IRS’s online tool, “Where’s My Refund?” Customer service representatives will be able to help only those taxpayers who filed electronically at least 21 days prior (six weeks or more in the case of a paper return) or who are directed to a representative by the Where’s My Refund? tool. EINs: According to the IRS, the EIN Online Assistant has been very successful, with more than 4 million requests processed per year. Beginning with the 2014 filing season, the IRS will handle all EIN requests using the Online Assistant, with only those with a previously assigned EIN being referred to an IRS representative. Practitioner Priority Service: The Practitioner Priority Service, which provides a way to resolve taxpayer account issues, is intended for tax professionals, but has been increasingly used by taxpayers. The IRS announced that, starting in January, use of the Practitioner Priority Service will be restricted to tax practitioners who are trying to resolve issues for their clients. Last week, the IRS announced that the filing season for individual returns would begin Jan. 31. This is later than the originally planned start date of Jan. 21 due to the government shutdown in October. Filing season for business tax returns, however, will not be similarly delayed. The IRS announced that on Jan. 13, 2014, it will begin accepting both paper and electronically filed business and excise tax returns, including Form 1120, U.S. Corporation Income Tax Return; Form 1120S, U.S. Income Tax Return for an S Corporation; Form 1065, U.S. Return of Partnership Income; Form 1041, U.S. Income Tax Return for Estates and Trusts; Form 720, Quarterly Federal Excise Tax Return; Form 940, Employer’s Annual Federal Unemployment (FUTA) Tax Return; Form 941, Employer’s Quarterly Tax Return; and Form 2290, Heavy Highway Vehicle Use Tax Return. The IRS emphasized that this date does not apply to unincorporated small businesses that report their income on Form 1040 on Schedule C, Profit or Loss From Business (Sole Proprietorship), Schedule E, Supplemental Income and Loss, or Schedule F, Profit or Loss From Farming, which are subject to the Jan. 31 delayed start.